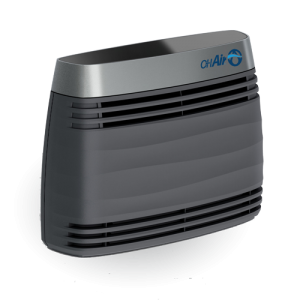 The ODOROX® OHAir MySpace™ A personal air purification system that is attractive, effective and shipping today. The OHAir® MySpaceTM unit is the right choice for personal use. The MySpaceTM unit is finely tuned to treat bacteria, virus, and chemicals commonly associated with Sick Building Syndrome. Typically this unit is used to treat a single room or small suite. It is portable or mounts on a wall for a simple installation. ODOROX®, OHAir™ MySpace™ and HGI Industries Inc. are either registered trademarks or trademarks of HGI Industries Inc. of Boynton Beach, Florida USA. Other trademarks are pending in the U.S. and other countries.